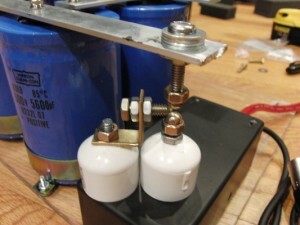 I built a capacitor pulse bank a while back. 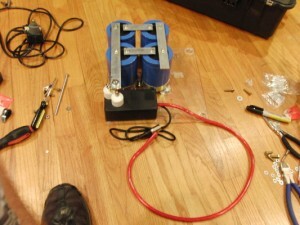 It was installed into a large suitcase, and was using Electrolytic capacitors (so no super-fast rise times, but a fairly decent amount of energy density for the cost). Caps: 6x caps rated 5600uF @ 500V ==> E =(1/2)*C*(V^2) = 4.2 kiloJoules of energy. The Pulse Bank was designed to fit into a Pelican 1600 case for durability and ease of transit. 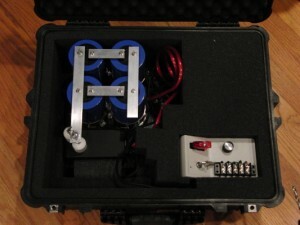 The case included a wired remote control, the capacitors, and a triggered spark gap. It was fairly simplistic in design, but useful for a time. While most of my project videos and files were lost in a set of failures long ago (who would have expected an entire RAID 6 and backup system to go within the same week), these photos are here at least as what was recoverable.